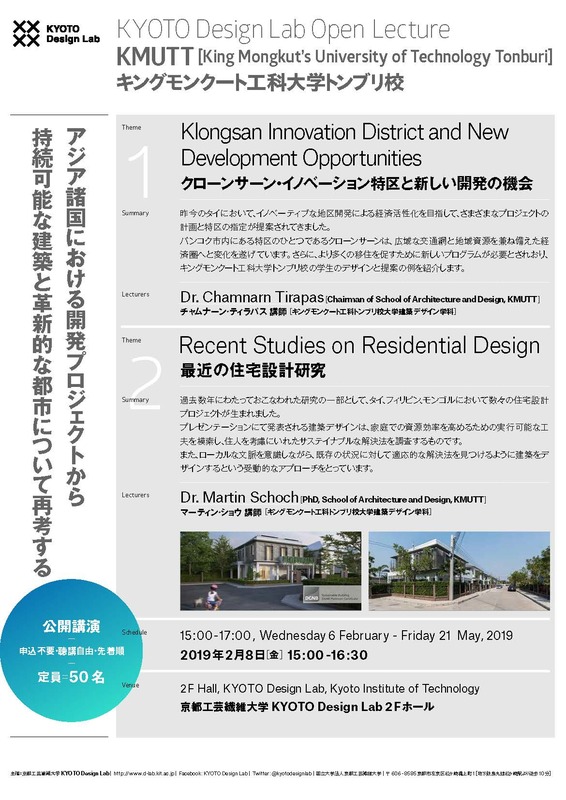 KYOTO Design Lab [D-lab] will hold public lectures by Chamnarn Tirapas and Martin Schoch (King Mongkut’s University of Technology Tonburi) in KYOTO Design Lab. Recently, innovation is an approach for driving Thai economy. Many projects and districts have been proposed to encourage creative or innovative districts. Klongsan is one of the districts in Bangkok where this policy is applied. Klongsan was a service or production area to serve Bangkok city since it was started. Nowadays, Klongsan is turned to be a new economic area with mass transit systems and its local resources. The study presents the impacts of the new developments on the land prices and development in the district. The approaches for district development to respond to the new policy. In addition, the new programs are needed in order to invite new people to live and promote innovation district development. Some examples of designs and proposals from KMUTT students to present opportunities from the policy within the area. Dr. Chamnarn Tirapas is a full-time lecturer at School of Architecture and Design. In 2004, he received M. Arch. from Ball State University, USA. In 2015, he received PhD. Arch. from KIT. Recently, he gives lectures in Design Studio, Building Materials and Constructions, and Thesis. In addition, he is the chairperson of Graduate School of Design and Planning, SoAD. As part of conducted research over the last years, a number of projects have related to residential designs in Thailand, the Philippines and Mongolia. The presented architectural designs explore viable strategies for improving resource efficiency of residential homes, and investigate sustainable solutions in regards to their occupants. Recognizing their local context, these designs aim to promote a passive approach, where buildings are designed to find adaptive solutions to existing conditions. Martin Schoch is a faculty member at the School of Architecture and Design (SoA+D) at the King Mongkut University of Technology (KMUTT), where he is teaching environmental technology and architectural design. He is conducting research in the field of sustainable, socio cultural design. As an licensed architect and consultant for sustainable building design, he is also an associate of Unexpected Co., Ltd., a design firm in Bangkok.